A trip to Italy sparked Zach Rosen’s interest in sleek interiors. He was 10. 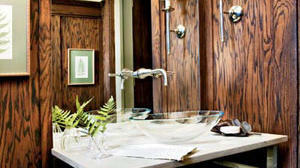 At 14, he conceived a plan for a gleaming remodel of his bathroom. He struck a cost-sharing deal with his parents, and then started work. See the complete makeover at Teen Design. 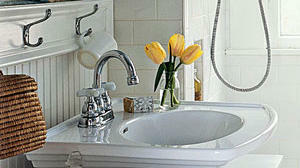 A stainless steel vessel sink is the room’s focal point. A dramatic wall faucet was installed through an opening in the mirror. 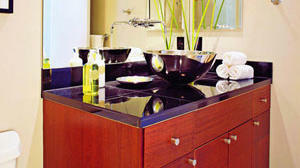 Black granite in 12-inch squares is a glistening complement to the fixtures. Zach is tall, so he installed a kitchen-cabinet base instead of a shorter bathroom vanity. 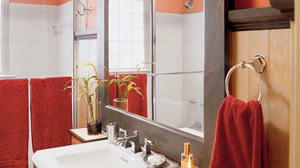 See how one MyHomeIdeas staffer took her bath from outdated to cutting edge on a tight budget. 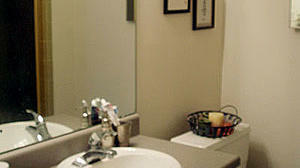 Look at Abbi’s successful bathroom transformation. Check out how she pulled it all off and came in under her original budget. Homeowners transformed their drab guest bedroom into the bathroom of their dreams. The renovation was easy because no walls had to be removed and only one door was closed off. After that, the space was quickly turned into a relaxing retreat. 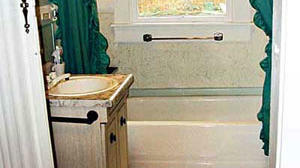 A black pedestal tub was placed next to the window, creating an ideal spot for soaking in the sunlight. The breezy white shower curtain hanging from a rod above the tub blends in nicely with the sheer curtains on the window. These dowdy small spaces needed big help. With some creativity and hard work, they were given a much-needed makeover to restore their original cottage charm as well as up-to-date conveniences. New gleaming fixtures, sleek white subway tiles, bead-board paneling, and decoupage map wallpaper transformed this dingy old bathroom into a light, bright room. 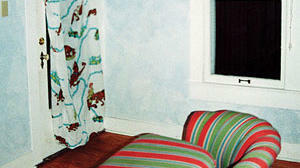 A mom-and-daughter team sought to transform this dated bath in their 1920s home. The finished product has a truly vintage feel and clean lines. 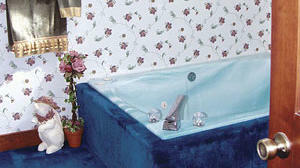 Pink tile and unsightly floral wallpaper were replaced with fresh blue bead board and white paint. Old green wallpaper darkened and enclosed an already tight area. 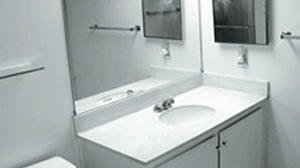 The main fixtures—the tub and toilet on one side, a pedestal sink and small cabinet on the other—consumed the space. The designers opened up the room by removing the old sink and installing a new limestone vanity in the corner, where it could become a focal point without blocking traffic. Out went the shutters, exposing the sleek steel-framed window and increasing the natural light. 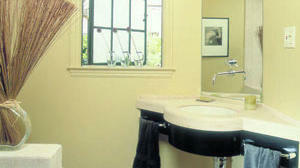 A low wall at the end of the tub screens the toilet and serves as a display surface. Browse the bathrooms that inspire us, and get a variety of ideas to create your own fantasy retreat. From modern luxury to low-key charm, we assembled all of our favorites to jump-start your bathroom makeovers. The trick is to turn the challenges of designing a powder room--the small size, the all-too-common lack of windows--into opportunities. Use the space to display art that is better viewed at close range, to experiment with layered lighting, or to hang a striking antique mirror. Most importantly, make a statement. Think about your space. Are you planning to update an existing powder room, transform a full bath into a half, or carve out a new spot within an existing floor plan? A larger space may have more design leeway, but in a tiny room, every item must function, fit, and contribute to the aesthetic. 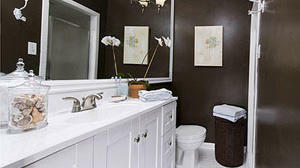 Read about other bathroom makeovers at MyHomeIdeas.com. 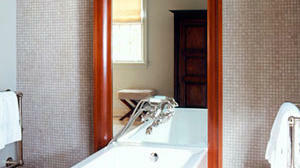 This vintage tub and eye-opening tilework reflect a retro spirit. Vivid green and turquoise subway tiles echo the color scheme of the rest of this beach house. 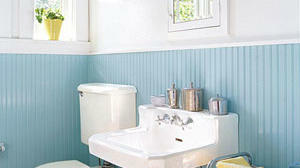 See other bathroom makeover ideas on MyHomeIdeas.com. Don’t go overboard with your bathroom plans. 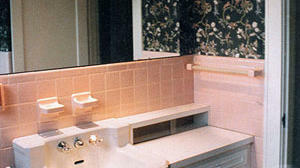 The ideal bathroom serves as a refuge--it's no place for fussiness. Scale down the variables to establish a soothing atmosphere, and stick to your budget. 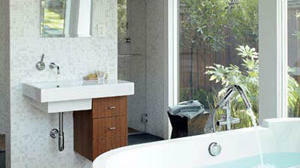 See the bathroom remodeling tips on MyHomeIdeas.com. Before you embark on a bathroom renovation, learn the common goals for every project, no matter the budget, style, or location. We promise to ease the pain of the makeover. 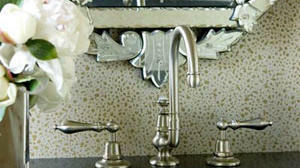 See more of this bathroom at SouthernLiving.com. Limited space doesn't have to limit creativity. This tiny bath maxes out with super style using a bold mirror and festive paint color.